The last in our series of blogs on FLOW-3D v11.2’s new developments is this discussion of the new tool for interactive geometry creation. This post will take you on a quick tour of a few applications and benefits of this tool. 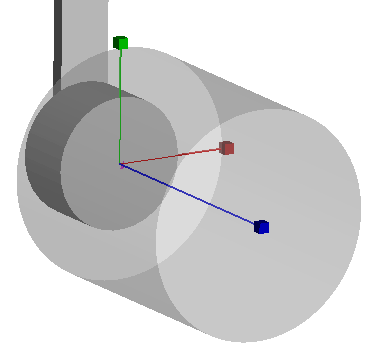 A common task in setting up a simulation is specifying the location of probes, valves, baffles, fluid/void pointers, and mass momentum sources. While many FLOW-3D simulations are run using geometry created in professional-grade CAD packages and imported as STL files, there is often a need to modify the geometry by adding geometry primitives such as boxes, cylinders, and spheres. If the original CAD geometry is available and the user is experienced in using their CAD tool, changes can be made to the original geometry. This process, however, can be time consuming and inconvenient. FLOW-3D v11.2’s interactive geometry creation simplifies the process of adding and editing various types of common geometry by allowing users to locate and resize geometry. Geometry changes can be made using normal-based location or feature-based location, which are discussed in the following sections. The normal-based location tool creates a probe at the location clicked. This method is convenient for creating geometry objects (e.g., history points) on a surface or placing a probe or valve relative to the surface along a line perpendicular to the surface. A sample application of normal-based interactive geometry creation tool is the creation of a history probe at a certain height above the surface of a river bed. The resulting location of the probe using normal-based location is shown below in the Create History Probe dialog. The feature-based location tool is perfect for placing geometry objects at the geometric center of an existing geometry feature. For example, to place a center a cylindrical shot sleeve at the center of the biscuit in a high pressure die was previously time consuming. With the feature-based location tool, simply click on the biscuit while in the Pick mode and the geometric center of the biscuit will be identified automatically. The user can then simply click on the face of the biscuit places a probe at the geometric center of the biscuit. The diameter of the shot sleeve can be easily adjusted by either grabbing the handles on each axis or dragging them onscreen or by typing in the diameter on the dialog. Developments aimed at speeding up the FLOW-3D solver and adding new physics models are valuable to our users, but equally important can be improvements implemented to save them time while setting up simulations. The new interactive geometry creation and modification tool is an important step towards mitigating the inconvenience of making changes to common geometry using CAD tools. Over the last two months, I have been writing blogs on the new features and developments in FLOW-3D v11.2 – starting with three blogs covering the new and improved particle model, followed by a post on mooring lines and ending with this discussion of interactive geometry creation and modification. The Flow Science team is hopeful that users will find our new additions useful.